This was a quite bizarre album in many ways - sombre wordsmith singing poet Leonard Cohen teamed up with off the wall perfectionist bombastic producer Phil Spector and produced a predictably "wall of sound" style soundscape of an album. Cohen's deadpan delivery and wry, often tongue in cheek lyrics sung over a backing full of crashing tambourines, drums and Spector veteran Steve Douglas's swirling saxophone. It was critically panned at the time, mainly by Cohen fans taken aback by its brash sound and risqué lyrics. Nowadays, it is hailed as a work of madcap genius. 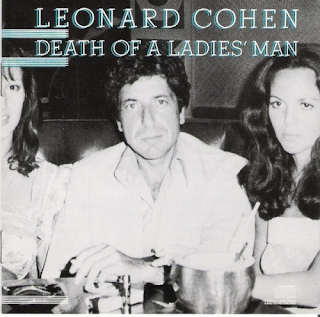 "True Love Leaves No Traces" is full of female backing vocals, a huge backing and Cohen's hangdog, laconic voice. "Iodine" is a very John Lennon-esque pice, reminding me of something from "Walls And Bridges" or "Rock 'n' Roll" in its production. Spector, of course, produced the latter. He also produced George Harrison's "All Things Must Pass", and there are many similarities here. There is some great saxophone from Douglas. Amazingly, considering it's Spector, the sound is stereo. A mushy stereo, however, obviously. "Paper Thin Hotel" also has echoes of Lennon. For me, it brings to mind Lou Reed too, for some reason. "You are the woman with her legs apart..." sings naughty old Leonard. Incidentally on the cover he is posing proudly with a couple of much younger women. "Memories" has a huge brass refrain, a massive production and Leonard lustily goes on about a woman's naked body and his own. Steve Douglas provides some great rock 'n' roll blaring saxophone. It a big, crazy, perplexing celebration of a track. "I Left A Woman Waiting" sees the tempo drop and Cohen goes very Velvet Underground in a "Sunday Morning" sort of way. Again, there is some sumptuous brass on this track. "Don't Go Home With Your Hard-On" is a saucy brass-driven romp that brings to mind Dylan's "Rainy Day Women". "Fingerprints" is a drunken singalong of a song, with some lively country-style fiddle. The title track is nine minutes of mournful Dylanesque lyrics sung by a cynical-sounding Cohen over an insistent piano and bashing drum sound. The whole album has been perhaps gloriously over-produced, perhaps disastrously so. To be honest I don't quite know what to make of it. Parts of it are quite inspirational and uplifting at times, at other times it a it of a sonic mess. I have to be honest and say that it doesn't get a play very often.